As is well-documented, I enjoy a good red lipstick. Recently I found what might have been my Holy Grail of red lipsticks except for one thing: it’s a limited-edition shade, and therefore could be gone before I know it. It is sad, but I’m doing my best to both attempt to talk the manufacturer into adding the shade to their permanent line, as well as resigning myself to the fact that it is an ephemeral love in my life. This lipstick shade is Bite Beauty’s Luminous Creme Lipstick in Mimosa. It’s listed rather innocuously as “warm red” on Sephora’s website. 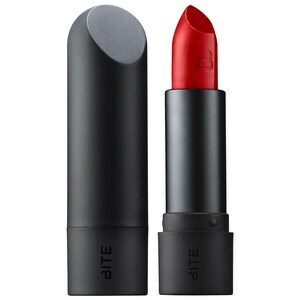 Now I’ve been disappointed in Bite’s warm red before, when Apricot turned out to be a little more brick than I usually enjoy in a lipstick. Mimosa, however, is more than just a warm red. It is a warm, vivid, bright red. It applies creamily and stays on well. I wore it to a crab feast and it lasted through three critters. I’ve taken to just applying one coat and blotting, and it still maintains its vigor. I like to think of it as my rainy day red because it is so bright and cheerful. We’ve had several grey, gloomy days lately, and I think a nice swipe of bright lipstick livens up the day. Every time I catch a glance in the mirror, my lips make me happy. And I just feel more confident on days when the weather might bring me down. Even when I don’t need to reapply, I sometimes just twist the bullet up to gaze at its lovely shade. A little odd, perhaps, but then, you haven’t seen this color in person. It is certainly not a shade for the shy, unless the shy are looking for a good way to assert themselves. But it is definitely a shade for a rainy day. And, as always, Bite Beauty lipsticks are food-grade, gluten-free, and leave my mind at ease about the lipstick prints on my lunch.